Good Old Sudoku is the most popular logic puzzle in Japan also known as Suduko, Sudoko, Su do ku, Sodoku, Suduku. It is very simple to learn, requires no calculations, and provides a surprisingly wide variety of logic situations. From children to old can enjoy it for a pass-time. The game refers to a number placement puzzle also known as Number Place in USA. First Japanese title of this puzzle is "Suuji wa dokushin ni kagiru". It's means that number is limited only single (unmarried). But this title is too long, then it was abbreviated as "Sudoku". So "SU" means number, "DOKU" means single. The puzzle seems to have first been published in the USA before being noticed and then popularised in Japan. The rules of the puzzle are simple. Each row, column and minibox comprises the numbers 1 through 9. The solver must complete the missing numbers. The attraction of the puzzle is that the completion rules are so simple and yet the overall task can be difficult. Sudoku is recommended by some teachers as an exercise in logical reasoning. This game also can be used as Sudoku solver. 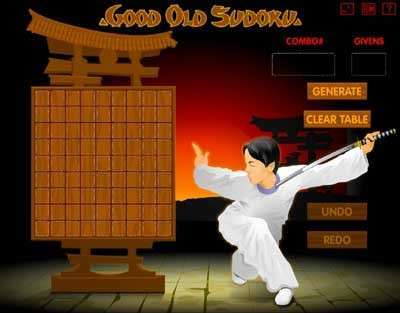 It is easy to solve your sudoku puzzles and try to find right solutions for any game combinations.